The Thelemic Tarot of the Book of Thoth deck, or any Tarot deck that utilises the Golden Dawn magical correspondences (777), requires the method called ‘dignities’ when used for divination. The method is fully explained in a related article: 15-card Thoth Tarot. The cards are read in sets of three, so we can apply the elemental dignities of the Tarot. 0. Prepare yourself and the deck by invoking. I invoke thee IAO, that thou wilt send HRU, the great Angel that is set over the operations of the Secret Wisdom, to lay his hand invisibly upon these consecrated cards of art. Thus shall I obtain true knowledge of hidden things, to the glory of thine ineffable Name! AUM. 1. Shuffle and cut the deck into three piles. Put them back together in one pile ensuring that the cards that were at the bottom of the deck before cutting are now on the top. 2. Lay out the first card. That will be the central focus. Place a second card to the right of the first. Place the third card to the left of the first. The significance of the centre card may then be evaluated according to the modifying influence of the other two (supporting) cards. In the sphere I am everywhere the centre, as she, the circumference, is nowhere found. Yet she shall be known and I never. The Thelemic Thoth Tarot Spread is a three-dimensional expansion of the three-card method. The first three cards will be laid out to form an upright triangle. The fourth card is numbered zero and placed in the centre. It is numbered zero as it represents Da’ath, the non-sephira figured by Set-Hadit. One should bear in mind that on the Tree of Life, Da’ath is the apex of a tetrahedron of which the first three numbers form the base. Prepare yourself and the deck by invoking. Shuffle, cut and replace the cards as previously described. 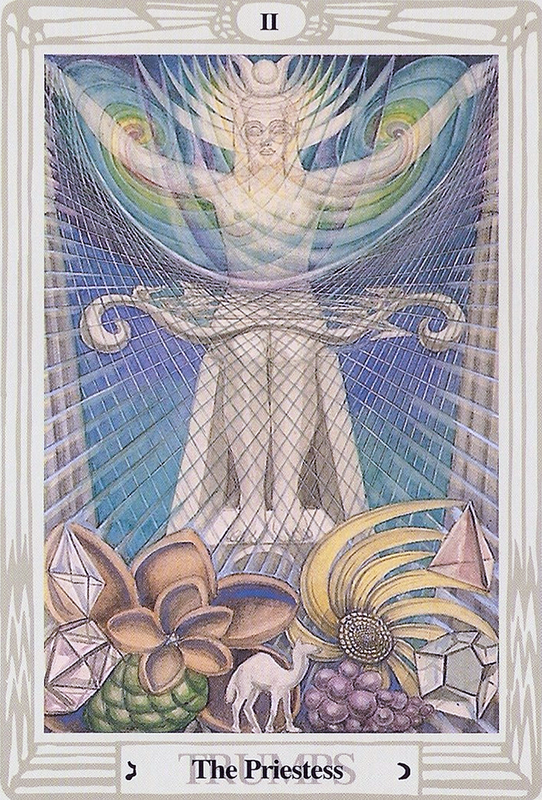 Lay out the cards as shown here, forming a supernal triad with Da’ath at the apex of the tetrahedron. The first card (Kether) is the focus for the matter that one wishes to know something about. The second and third cards (Chokmah and Binah) modify it as according to their nature. Thus, the method of reading by dignities is identical to the three-card spread, except the second and third cards are dropped below to form the base of the pyramid. The first three cards symbolise how things appear. They represent, therefore, the matter itself that is the subject of the enquiry, as exoteric. The centre card, the apex of the pyramid, symbolises the Will, which is esoteric. The centre card thus supplies an answer to the question, or a way in which the question may be approached so that better understanding is gained. That may require further meditation, or otherwise be suggestive of certain actions to be taken. Bear in mind that the nature of the Will (Hadit) is esoteric. The ‘Effect’ (Nuit’s appearance) is exoteric. Thus, however skilful we may be in the art of divination, and however adept we may be with the method of dignities, what we are seeking may not be fully revealed until reification of the Will-current has come about. Nonetheless, when divination is performed with the right attitude of mind, a powerful magical operation is set in place. A magical act has been declared. The invocation appeals to the ineffable. That which is hidden will surely and most certainly come to light. 1. Liber AL vel Legis, I: 41, “The word of Sin is Restriction”. 2. The Sign of the Four and other stories, Sir Arthur Conan Doyle. The Esoteric Doctrine of Thelema is revealed in ‘Lapis Philosophorum’, Babalon Unveied! Thelemic Monographs [Ordo Astri]. The Fifteen-card or ‘Thoth’ Tarot spread seems to have been devised by the publisher of some early editions of the Crowley-Harris Thoth deck. The advantage of the spread is that cards are read in sets of three, so the elemental dignities of the Tarot can be applied. The method of laying out the cards forms a widdershins spiral, outward from the centre. 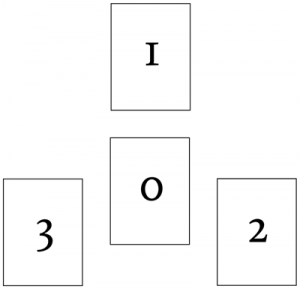 The three centre cards (see diagram below) represent the question and the questioner. The upper left cards are a future development of the upper right cards, if the two sets agree. If the upper left and upper right cards do not agree, then the upper right position represents the course of action the querent would naturally take, and the upper left cards an alternative course of action that changes the natural outcome. The lower left cards represent the attitude of the querent or psychological basis of the question. The lower right cards represent destiny, spiritual forces or karma beyond the control of the querent; as such, these three cards are to be regarded as advice. 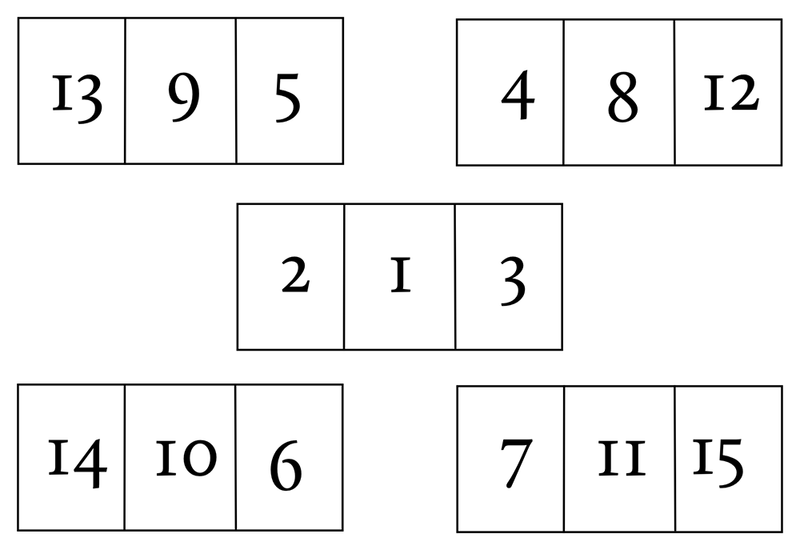 The Fifteen-card spread has six cards (centre and lower left) that represent the questioner. This can produce surprising insights. It is often not realised quite how much the question and its likely outcome is determined by the spiritual, mental and emotional state of the questioner. Here is an example of the cards on the top right and the top left in agreement. The cards Adjustment VIII and The Priestess II mirror each other; they are both feminine figures, represented by Libra and the Moon respectively. The Five of Disks mirrors the Prince of Disks; the Ten of Wands mirrors the Nine of Wands. Since the two sets of cards are clearly in agreement, there is a flow or natural development of the future, reading from right to left. Traditionally, the cards on either side are used to evaluate the meaning of the centre card. The elemental qualities of classical hermeticism are used. If (for example) a card of Wands has a Wand on either side, it is greatly strengthened for good or ill, according to the nature of the cards on either side. If a card of Wands has a Cup on either side, it is greatly weakened for good or ill, according to the nature of the cards on either side. If a card of Wands has a Sword or Disk card on either side, it is moderately strengthened by those cards, according to their nature. If a card of Wands has a Cup (inimical) on one side, and a Sword (mutual) on the other side, it is said that the ‘Sword takes the Cup to the Wand’ and the Wand is moderately strengthened according to the nature of the two cards on either side. But if the Wand has on one side a Sword and on the other side a Disk, it is said that the two cards on the outside cancel or neutralise each other, since Swords and Disks are opposite in nature. In that case the two cards on either side have little or no effect on the Wand in the centre. Trump cards, as a rule, greatly outweigh the small cards; their operation is on a different plane and in a reading they tend to represent spiritual forces or destiny. One must be careful, therefore, when there is a mixture of trumps and small cards. The trump cards correspond to zodiacal, planetary and elemental forces. Fortune X (for example) corresponds to Jupiter, and so if this card appeared with The Hermit IX, which corresponds to Virgo, the effect would be similar to that of Jupiter in Virgo in an astrological chart. The Tower XVI corresponds to Mars and so if this card appeared with The Empress IV, the trump for Venus, the action would be similar to Mars aspecting Venus in an astrological chart. The three elemental trumps can be problematical. The Fool 0 (for example) is the primary element of Air. What if this card appears with The Devil XV, corresponding to Capricorn, a cardinal Earth sign? Air and Earth are inimical, yet the trumps are more than elemental; they are composite glyphs that mirror the paths of the Tree of Life. Two trump cards will not simply ‘cancel out’. Fortunately the outer planets, Uranus, Neptune and Pluto, can be assigned to the elemental trumps. The effect of The Devil XV and The Fool 0 together can be taken as similar to that of Uranus in Capricorn. In any reading one should look first to see if there is a predominance of any element or type. Many Wands in a reading, for example, would indicate much energy and activity. A majority of court cards would indicate that many persons were involved in the question, or there is much social activity. A large number of trumps in a reading indicate forces of destiny or karma involved with the question. Each of the 12 Thoth Tarot zodiacal trumps are fully explained here, with key Qabalistic references. View Magical Theurgy—Rituals of the Tarot and other books here.